It's times like these I wish I had a beautiful white wooden floor like Kate.. I thought it would be nice to focus on the areas which often get forgotten about on here, so here are a few of my favourite things from the past month. This month I've been running a little more often, and picked up these lovely exercise leggings from Sports Direct for just £5 each! They're super stretchy, and 'one size fits all' - so they're really comfortable. Although I find I do have to have them bunched up to just below my knee or they begin to head south! The lilac ones also match my trainers perfectly, so I'm very glad I found them. Next up are these gorgeous postcards from Rifle Paper Co. I am a woman possessed when it comes to these! If I happened to find any lurking in the corners of shops, I simply have to take them to the till. I found a couple during my trip to Brighton, and picked up a couple more from a shop in my hometown. I currently have them dotted around my bedroom, but hope to frame a couple one day when I get my own place. 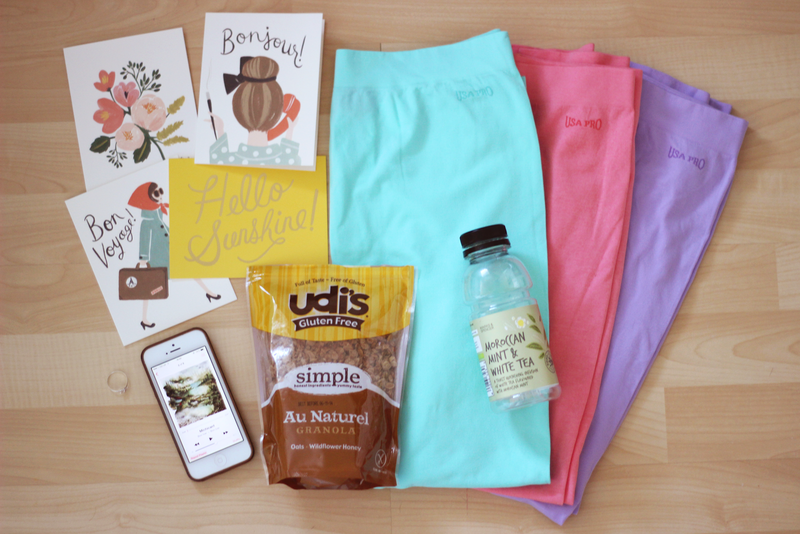 Since writing this post, I've bought four more for upcoming birthdays and weddings! Now for an unusual one.. Udi's Gluten Free Granola. I am a massive fan of granola, and love to begin my day with a big bowl of the stuff along with some chopped banana and berries. Recently I've been trialling a gluten free diet, so was over the moon to find this little bag in Tesco! Wonderfully crunchy, and ever so slightly sweet, this gets two thumbs up from me. On to music, I've fallen oh so deeply back in love with Bon Iver. My current favourite is 'Michicant'. A simply beautiful song, and perfect summer evening driving soundtrack. I found this lovely drink in M&S the other day, and I am hooked. 'Moroccan Mint & White Tea', it's just so good, especially ice cold from the cooler! I'll be picking this up every time I treat myself to an M&S lunch during work. Last of all, the smallest thing in the whole picture, which you probably can't even see, and didn't notice (so I'll pop a close up down below!) 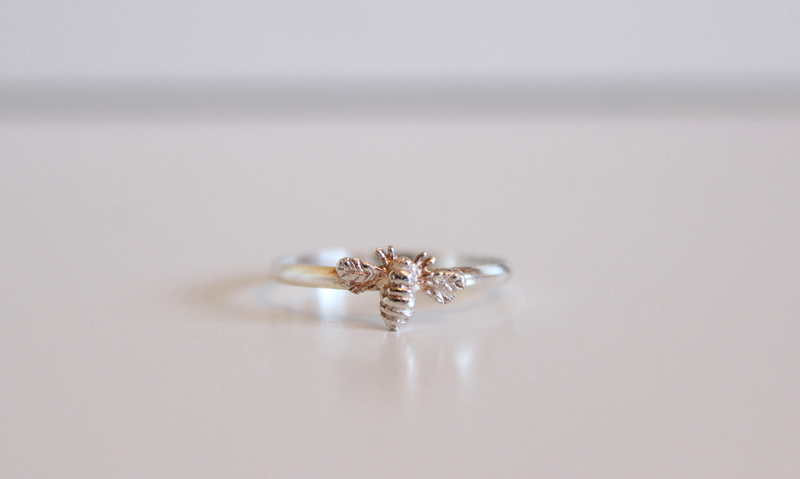 is a gorgeous white/rose gold bee ring from Accessorize. I spotted it in their sale a couple of week ago, and it was part of a set of three. I've since lost the other 2 rings that came with it, but was only really interested in the bee anyway. It's barely left my finger since I left the shop! Lovely collection! I absolutely love Rifle Paper Co they have some beautiful stationery! I also adore the M&S Drink. I found out about it in such a weird way, a couple were having it on a train so me and Darren were intrigued as to if it was nice or not and they were like "omg yes!" so the next time we were in we bought two flavours.